1920 අග භාගයේ දී, ද සොයිසා බැක්ටීරියානුවේද (වර්තමාන වෛද්‍ය පර්යේෂණ ආයතනය) ආයතනයේ අංශයක් ලෙස, වෛද්‍ය ලූෂන් ඒ නිකලස් මහතාගේ ප්‍රධානත්වයෙන් පෝෂණ අංශයේ ආරම්භය සනිටුහන් විය.අපගේ ආරම්භක පරමාර්ථය වූයේ ශ්‍රී ලාංකීය පෝෂණ තත්ත්වය පිළිබඳ වාර්තා සම්පාදනය කිරීමය. කල් යත්ම අපගේ සමීක්ෂණ හා වාර්තා සැළකිල්ලට ගනිමින් රටේ ආහාර අවශ්‍යතාවය ගණනය කිරීම ,ජාතික වැටුප් තල සකස් කිරීම, ආහාර මුද්දර හා සළාක, සමෘද්ධි, ආදී සහනාධාර වැඩසටහන්ද සකස් කරන ලදී. අපගේ පර්යේෂණ වලදී ඉතා වැදගත් සොයාගැනීම් කරන ලද අතර ඒවා නිවැරදි කිරීම සඳහා පසු කාලීනව රජයයන් විසින් විවිධ ක්‍රියාමාර්ග ගන්නා ලදී. එකල ඉතා සුලබ වූ මන්දපෝෂණ තත්ත්වය පාලනය කිරීම පිණිස අපගේ නිෂ්පාදනයක් වූ "ත්‍රිපෝෂ" මහෝපකාරී වූ අතර එය ජාත්‍යන්තරව,මන්දපෝෂණය පාලනය කිරීම සඳහා වූ හොඳම පරිපූරක ආහාරයක් සේ පිලිගැනේ. ලාංකීය ආහාර වල සංඝටක ප්‍රමාණ පර්යේෂණාත්මකව සොයා එම වගු සැකසීම, නිර්දේශිත ආහාර වේල් සැකසීම ආදිය අපේ අනෙකුත් ප්‍රමුඛ කාර්යයන් විය. මේ සඳහා අවශ්‍ය ආහාර වල අඩංගු විටමින, ලවණ ආදිය පවා පරීක්ෂා කල හැකි සහතිකලත් දියුණු පර්යේෂණාගාර පහසුකම් හා පුහුණු පර්යේෂකයින් අප සතු වේ. ශ්‍රී ලාංකීය ප්‍රජාවේ පෝෂණ තත්වය, ආහාර සුරක්ෂිතතාවය හා සනීපාරක්ෂක පහසුකම් ආදිය පිලිබඳ, ලෝකයේ ඕනෑම රටකට නොදෙවෙනි ලෙස මුලු දිවයිනම ආවරණය වන පරිදි විද්‍යාත්මකව රැස් කල යාවත්කාලීන දත්ත සමුදායක් අප සතුය.මේ සඳහා අත්දැකීම් බහුල ක්ෂේත්‍ර පර්යෙෂණ කණ්ඩායම්, දත්ත සකසන්නන් ,විශ්ලේෂකයන්, සංඛ්‍යානඥයින් හා ප්‍රජා වෛද්‍ය විශේෂඥයින් ඇතුළු ජගත් පැසසුමට ලක්වූ කණ්ඩායමක් අප සතුය. රාජ්‍ය මෙන්ම ,එක්සත් ජාතීන්ට අනුබද්ධ ආයතන මෙන්ම, රාජ්‍ය නොවන ආයතන හරහා ක්‍රියාත්මක වන වැඩසටහන් සැලසුම් කිරීමටත්, ඒ සඳහා අවශ්‍ය මූල්‍ය පහසුකම් ලබාගැනීමටත් මෙම දත්ත බහුලව පදනම් කර ගැනේ. 2009-2010 වකවානුවේ යුධ ගැටුම් වලින් අභ්‍යන්තරව අවතැන්වූ සහෝදර ජන සමූහයේ තිබූ උග්‍ර මන්දපෝෂණ තත්ත්වය ඉතා කෙටිකලක් තුල පාලනය කල ආකාරය වර්තමානයෙදී ලොව පුරා පූර්වාදර්ශයක් සේ සළකනු ලැබේ. ලාංකීය ළමා පරපුරේ විටමින් A, යකඩ හා අයඩින් ඌනතාවයෙන් මිදීම සඳහා අප විසින් කරන ලද පර්යේෂණ , සැළසුම් හා පසු විපරම් මහෝපකාරී විය.එහි ප්‍රතිඵලයක් ලෙස අයඩින් ඌණතාවය තුරන් කිරීමේ කඩඉම කරා අප පැමිණ සිටී. දශක ගණනාවක් පුරා කරන ලද විවිධාකාර වූ වැඩසටහන් තිබියදී පවා ගැටළුවක්ව පවතින යකඩ ඌණතාවය තුරන් කිරීමේ නවතම ක්‍රියාමාර්ග කරා අපි එළඹෙමින් සිටිමු. විවිධ සම්මන්ත්‍රණ, මාධ්‍ය හමු, වෙබ් හා බ්ලොග් අඩවි, විද්‍යුත් හා මුද්‍රිත මාධ්‍ය මෙන්ම විශේෂිත වූ පෝෂණ තොරතුරු මධ්‍යස්ථානය හරහා පිරිස දැනුවත් කිරීමද අප විසින් සිදු කරන කාර්යයකි. දේශීය හා විදේශීය ප්‍රථම හා පශ්චාත් උපාධි ආයතන, හෙද හා මහජන සෞඛ්‍ය පුහුණු පාසල් හා විවිධ වෲත්තික ආයතන හා සමීප සබඳතා පවත්වා ගනිමින් එම සිසුන් හා වෲත්තිකයන් පුහුණු කිරීම සඳහා න්‍යායත්මක හා ප්‍රායෝගික යන දෙ අංශයෙන්ම සම්පත් දායකයන් ලෙසද අපි කටයුතු කරමු. සෞඛ්‍ය ක්ෂෙත්‍රයේ සියළු අංශ හා අනෙකුත් ක්ෂේත්‍රද එක්ව පෝෂණීය ලාංකීය ජනතාවක් බිහිකිරීමෙහිලා මෙතෙක් අප ආ ගමනේ ලබාගත් ජයග්‍රහණ අතිමහත්ය. අපගේ ශක්තීන් පෙරදැරිව වඩාත් පැහැබර අනාගතය කරා ගමන් කරමින් අප අරමුණු ලඟා කර ගැනීම අපගේ ඒකායන අරමුණයි. During the dietary surveys, many deficiencies were identified throughout the Nation. To overcome this issues, ‘Thriposha’ was invented and distributed throughout the country while maintaining a regular monitoring system. Over time, ‘Thriposha’ was accepted internationally as a world-renowned supplementary food. 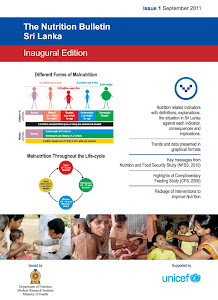 Through out the years, the Department published Food Composition Tables of Sri Lanka using available food analysis to identify the nutrients in Sri Lankan food. Along with this, social benefit programmes (Coupon systems, Food Rations, Samurdhi ), consumer Recommended Daily Allowances and estimation of the amount of food needed for the country were established. The Department contains the field unit, laboratory and research co-ordination and information unit. The field unit consists of highly recognised staff involved in; data collection, anthropological surveys and measurements, sample collection and dietary surveys in the filed. The accredited laboratory unit possesses urinary iodine, salt iodine, food and vitamin and mineral testing facilities with highly trained staff. We also have the wealth of experienced data analysts, statisticians, and consultant community physicians that contribute to our Department. Through out the years, we have done abundant surveys such as monitoring childhood Vitamin A status, malnutrition states and iron deficiency both routinely and in emergency situations. We have essentially reached iodine deficiency elimination through out Sri Lanka. As well as successful surveys, the Department is involved in undergraduate and postgraduate training of medical and non-medical personnel, conferences, media seminars, and public education via official website and blog, printed and electronic media and the Nutrition Information Centre.